A newly-diagnosed confirmed primary pancreatic, [lower] oesophageal, gastric, primary liver or biliary system cancer (some histological types are excluded). Potential participants are identified through hospital admission data extracts and/or Victorian Cancer Registry data extracts. The registry uses an opt-out approach for recruitment with a waiver of consent for deceased patients. Potential participants are sent an Invitation Letter and Information Book. Potential participants or their proxy have two weeks from the date on the Invitation Letter to opt-out before any of their health information may be collected. Participants can opt-out at any time and request for their data be removed from the registry. Clinicians are not required to collect data for the UGICR. Data is primarily collected from electronic or paper medical records by UGICR data collectors, with some data also collected from the Victorian Cancer Registry where possible. The information collected includes data about: demographics, diagnostic information, and treatment information. Quality indicators are specific to each module and are determined by the working parties. Patient-Reported Outcome Measures (PROMs) will be developed and implemented in the future. These are assessments of overall health and quality of life as reported by patients at specific time points after diagnosis. 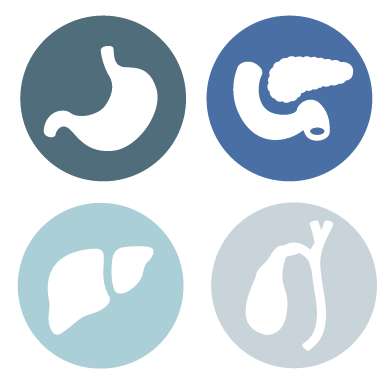 The pancreas cancer module is currently being implemented at all approved sites. The oesophagogastric module pilot phase began in November 2017 at 3 hospitals. The remaining modules, biliary and primary liver, are planned for development and implementation in the future. What are Clinical Quality Registries? CQRs systematically collect data on all episodes of care relating to a patient’s diagnosis of a particular disease (i.e. upper GI cancers), with the aim of improving patient outcomes through the assessment of the quality of care provided by healthcare institutions. Data are used to inform pre-determined, disease specific quality indicators (QIs) and participating sites are benchmarked against these QIs in regular reports. When outliers are identified, sites are responsible for investigating the cause and implementing changes where necessary. What is a quality indicator? Is the UGICR collecting Patient-Reported Outcome Measures? Patient-Reported Outcome Measures (PROMs) will be developed and implemented, once the registry has matured. These are assessments of overall health and quality of life as reported by patients at specific time points after diagnosis. This registry has been established out of a desire to improve both the quality of life and length of survival for Australians with upper GI cancers. Clinical quality registries achieve improvements in care primarily by informing health care providers how they are performing, compared with others. If a provider is falling behind on a performance indicator, compared with others, this provides them with both the information and motivation to improve. This reduces unwarranted variation in care and improves compliance with existing clinical guidelines. Who is operating the UGICR? The UGICR is run by the Cancer Research Program (CRP) within the School of Public Health and Preventive Medicine at Monash University. The UGICR Coordinating Principal Investigator and Head of CRP is Prof John Zalcberg, and the UGICR Coordinator is Ms Jennifer Holland. The development and operation of the UGICR is overseen by a Steering Committee and clinical working parties. Can clinicians access their registry data? Clinicians contributing data to the UGICR, can request their own data from the UGICR Coordinator. The types of data collected includes: demographics, diagnostic information, and treatment information. Please contact the UGICR Coordinator for more detailed information regarding what is collected.